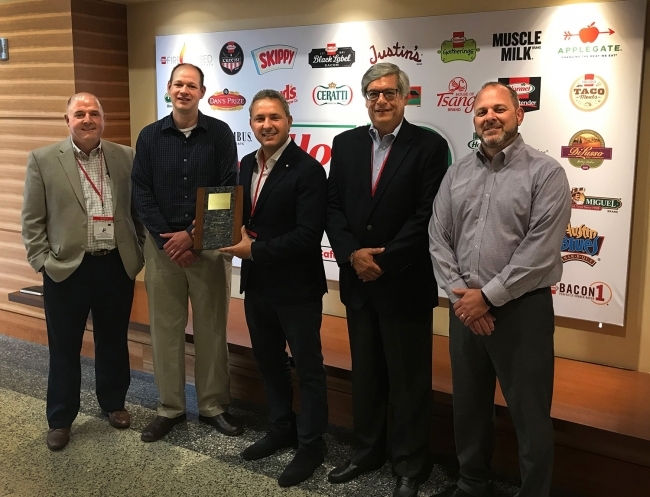 CINCINNATI (July 11, 2018) – Hormel Foods presented its Spirit of Excellence Award to ProAmpac, one of the fastest growing flexible packaging manufacturers, on June 27. This award recognizes the consistent level of service and quality from ProAmpac’s Terrebonne, Quebec facility and its commitment to continuous improvement. Using a universal measurement system, Hormel Foods ensures all suppliers are held to the same standards. Award criteria include meeting performance requirements, making on-time deliveries and providing high-level customer support. Josh Becker, corporate buyer for Hormel Foods, along with Southard, presented the award to Vince Musacchio, president of ProAmpac’s Global Flexibles Division. “We continue to celebrate our successful partnership with Hormel Foods. We are honored that Hormel Foods recognizes our dedication to service and quality,” stated Musacchio. “To recieve this award from a company that itself is the recipient of numerous accolades for its commitments to consumers, employees and corporate responsibility is especially meaningful,” he added. ProAmpac provides Hormel Foods with its PRO-POUCH® product. These high-performance, premade stand-up laminate pouches can be made with adhesive or extrusion processes, with and without foil, to meet a variety of liquid and dry product requirements. To learn more, visit ProAmpac.com.